D.1-5) Study the following information carefully and answer the given questions below. Eight friends A, P, B, Q, C, R, D and S are sitting around a circular table in a Tea Shop. Each of them likes different types of Tea (i.e.) Black Tea, Green Tea, White Tea, Lemon Tea, Puerh Tea, Herbal Tea, Honey Tea and Oolong Tea but not necessarily in the same order. P sits third to the right of the one who likes Lemon Tea. C likes Oolong Tea and sits second to the left of the one who likes White Tea. The one who likes Black Tea sits opposite to D. Those who are like Green Tea and Herbal Tea sit opposite to each other. 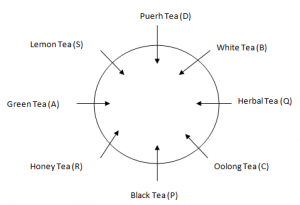 R likes Honey Tea and is an immediate neighbour of A and P. Two persons sit between Q and R. S sits to the immediate neighbour of D, who likes Puerh Tea. A does not like Herbal Tea but sits third to the right of White Tea. Q is not an immediate neighbour of S, who likes Lemon Tea. Q.1) Who among the following likes Black Tea? Q.2) Who among the following sits third to the right of R? Q.3) What is the position of C with respect to the one who likes Green Tea? Q.4) B likes which of the following Tea? Q.5) How many people sit between the one who likes Honey Tea and the one who likes White Tea? D.6-10) Study the following information carefully and answer the given questions below. Six persons H, I, J, K, L and M are buying different brands of watches (i.e.) Fast rack, Rolex, Omega, Citizen, Titan and Casio are born in different months of the same year viz. September, July, May, January, March and November but not necessarily in the same order. H buys Rolex watch but not in January month. There are two persons buying watches between J and the one who buys Omega watch. The one who buys Casio watch in the month which has 30 days. L does not buy either Omega watch or Citizen watch but buys watch in July month. M buys Fast rack watch immediately before the one who buys Citizen watch. K buys Casio watch after the one who buys Titan watch. J buys one of the months which have 31 days. Q.6) Who among the following buys Omega watch? Q.7) Rolex watch bought in which of the following month? Q.8) How many persons buy watch in between M and the one who buys Titan watch? Q.9) Which one of the following combination is correct? Q.10) If all the persons are arranged in alphabetical order then which of the following is false?